* Born Mahmoud Reda Abbas "Abu Mazen" in Safad in 1935. * Forced to resort with his family to Syria after the attack on the city of Safad and its occupation by the Jewish organizations in April 1948. * At the age of thirteen he had to work to help his family for two years, later joined the school and completed the secondary stage and worked as a teacher, continued his study at home and obtained a high school, then attended the University of Damascus, affiliation with a Bachelor in Law in 1958. * In 1957, he worked at the Ministry of Education of Qatar as Director of personnel, during which he visited the West Bank and Gaza Strip several times to select the teachers and staff to work in Qatar. He continued his work until 1970, where he devoted himself fully to the national duty. * He contributed to the establishment of the Palestinian National Liberation Movement (Fatah), which was launched in 1965. * Served as a member of the Central Committee of Fatah Movement since 1964. * Served as Secretary of the Executive Committee of the Palestine Liberation Organization since 1996. * Chaired the Department of National and International Relations of the Palestine Liberation Organization between 1984 and 2000. * Represented the Palestine Liberation Organization in several formal occasions, including the signing of the Declaration of Principles “Oslo Accords” in Washington on 31st September 1993 and the signing of the Interim Agreement in Washington on 23rd September 1995. * Headed the Palestinian delegation at the signing of the Declaration of Principles “Oslo Agreement” on 13th September 1993 in Washington. * Headed the first Palestinian elections Committee between the years 1996 to 2002. 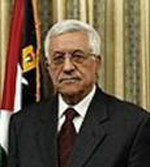 * Served as the first Prime Minister of the Palestinian National Authority in April 2003. * Elected President of the Palestine Liberation Organization in 2004. * The author of numerous books including: “Zionism is the Beginning and the End”, “Arch of evil”, “other side”, “The Fall of Natanyahu’s Government”, “Ethnic and Religious polarization in Israel”, “Using the Oslo in addition to many important studies”.